Noseholes and elephants! A pet-eating monster interrupts Princess Magnolia's perfect playdate with Princess Sneezewort, but who is that new masked avenger? Illustrations. 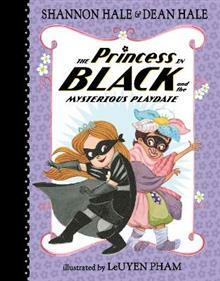 Shannon Hale and Dean Hale are the award-winning husband-and-wife team behind the Princess in Black series, illustrated by LeUyen Pham. Shannon Hale is also the author of the Newbery Honor novel Princess Academy as well as the New York Times best-selling series Ever After High. Shannon Hale and Dean Hale live in Salt Lake City, Utah. LeUyen Pham is the illustrator of many books for children, including God's Dream by Archbishop Desmond Tutu and Douglas Carlton Abrams and Aunt Mary's Rose by Douglas Wood. LeUyen Pham lives in California.